Pharoah map of Coorg, Karnataka, India. This is a beautiful 1854 map of the Coorg or Kodagu District in Karnataka India. Issued by Pharoah and Company, it covers the entire district with the capital Mercara or Madikeri identified. Notes important towns, roads, lakes, rivers and topography. 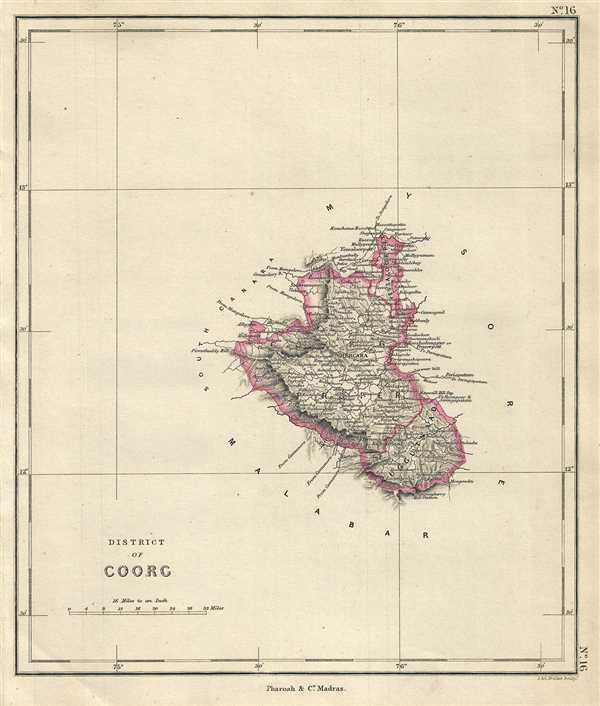 The Province of Coorg was established in 1834 under British India after the Kingdom of Coorg and its territories were annexed to East India Company. Today the region is a popular holiday destination and is famous for its coffee plantations. This map was engraved by J. and C. Walker and issued as plate no. 16 by Pharoah and Company in their 1854 Atlas of Southern India.